Yes, I have read the King James Version (KJV) of the Bible; twice, from cover to cover each time, and parts of it I have read several times more. I must confess that the last time I read the entire Bible was at least fifty years ago, and I did not commit it to memory, so I must now re-read some of it in order to verify certain things I will be referencing during this review. This is a book review of a PARTICULAR EDITION OF THE BIBLE, not a critique of religion. OK; hope that sets the record straight, and now for the review . . . 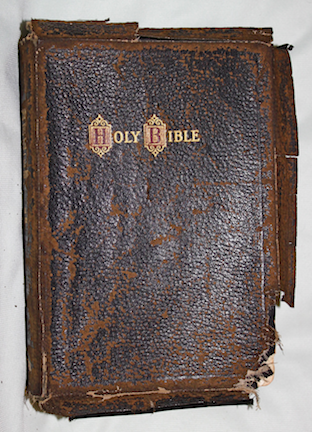 Alert readers, such as yourself, have no doubt noticed that this Bible pictured above is a bit tattered around the edges, even though the cover is genuine leather. Although the cover is, indeed, genuine leather, it is paper thin, and has not fared well through the decades. This is not a real problem because the content remains in fine shape. This edition was published by the John A Hertel Company a near the end of WW II ( with copyrights dating back to 1926), and was a gift from my mother on November 21, 1945 when I was a child, ten years old. 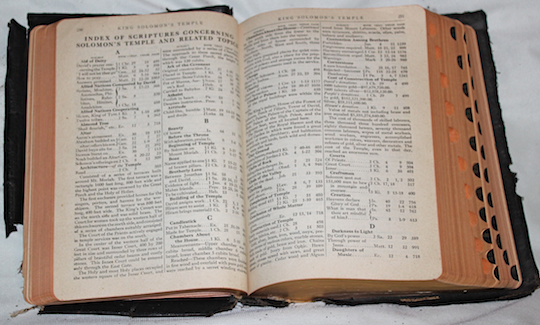 * An Alphabetical and Cyclopedic Index for hundreds of topics in the scriptures. 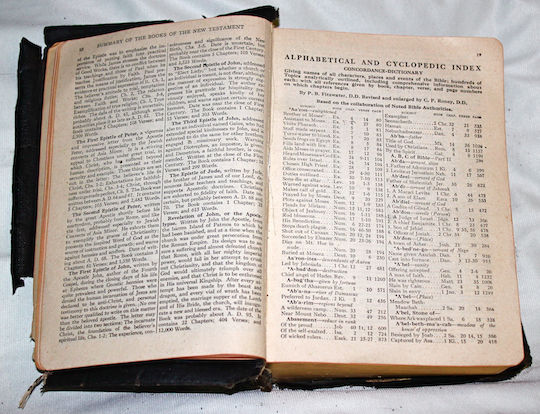 This index fills 230 pages, with about 80 entries per two-column page, as, shown on the right-hand side of the photo, below. * An Index of Scriptures concerning Solomon’s Temple and Related Topics. This index fills eight pages. One might wonder why the publisher chose to include eight pages about Solomon’s Temple, but let’s move on to other “extras” . . .
* 23 pages of “other stuff”, including such things as Bible Quotations used by the Greatest Statesmen and Orators of all Time. 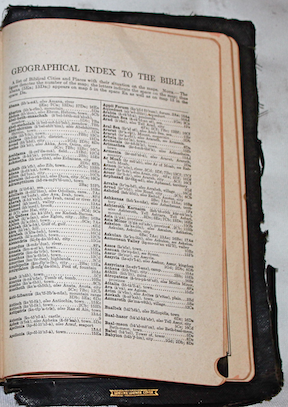 Unfortunately, the publisher chose NOT to list the statesmen and orators names, nor is there a reference to any source for such information – just the scriptural references are listed. * An Old Testament Chronology, complete with five pages of charts showing all significant events from creation to 430 BC. 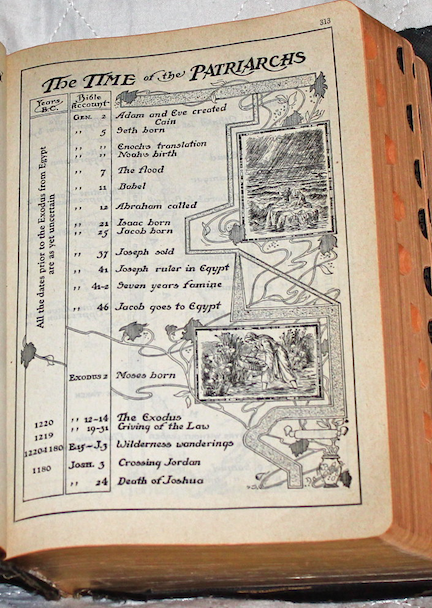 This chronology, of course, adheres to the geocentric cosmology and genealogy found in the Old Testament. 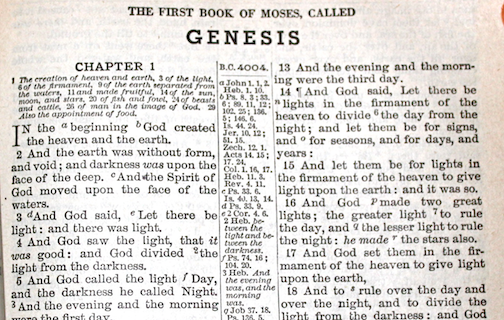 Which brings us to the Preface to the Authorized Version of the KJV, along with a Table of Contents for both the Old and the New Testaments, which precedes 1,273 pages of text containing the scriptures of both the New and Old Testaments. 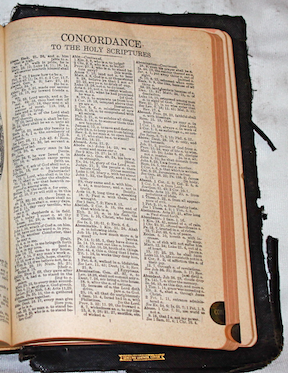 The scriptures are in two-column format, with an additional narrow column separating the two main columns. Now, both YOU and I know what the middle column is all about. A photo of the Format is shown below. 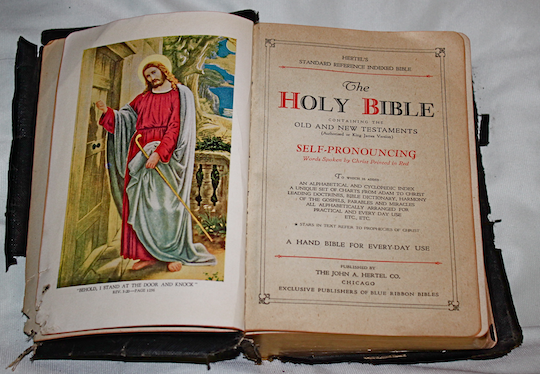 This particular Bible may contain more scriptural references and / or cross references than any other book in existence. No, I’m not going to review each book in the OT and the NT. That content can be found in any edition of the Bible, and requires no comment or discussion here. All of which brings us to the “extra” pages that follow the NT scriptures. 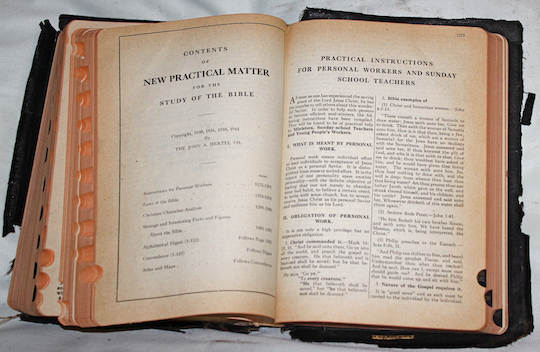 Immediately following the last book in the NT, Revelations, we find over 200 pages containing: “Contents of New Practical Matter for the Study of the Bible” which includes text and graphics, detailed, below. Next, we find . . . Following the two items listed, above, there is an . 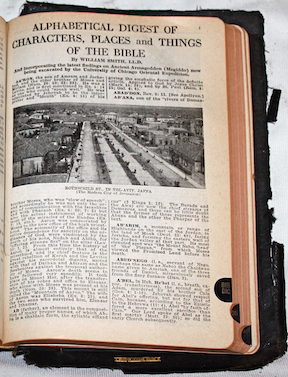 . .
Next comes a Concordance to the Holy Scriptures filling125 three-column pages. Following the Concordance there is a Geographical Index to the Bible which includes villages, cities, rivers, seas, etc. 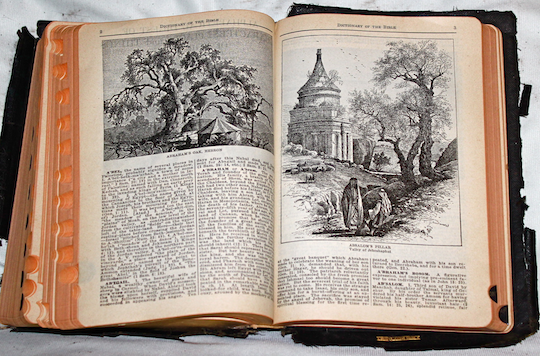 along with maps and drawings of countries, provinces, temples, towns, etc. See below . . . 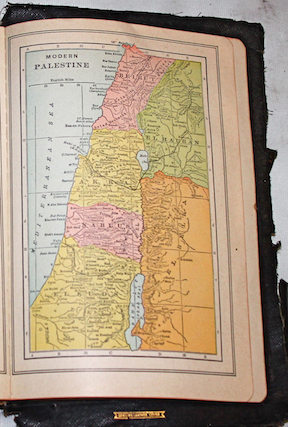 It is interesting to note that the map of Palestine pictured above shows the country as of about 1928, long before the country of Israel existed. 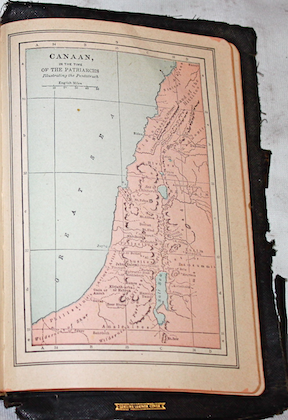 Prior to being Palestine, in biblical times it was knows as Canaan, as shown in the map, below. That pretty well wraps up this book review. Further comment or discussion might lead to religious topics, which is NOT the intent of this review. Hope you have enjoyed the ride ! This entry was posted in Miscellaneous Musings, The Bible and tagged Authorized King James Version, bible, New Testament, Old Testament, The Bible. Bookmark the permalink. Very pleased that you visited my blog once more, and glad you like the book review. By the way, your blog is one of the most interesting ones I have found. Sharing one’s life with the whole world can be a scary thing to do, and you seem to find the practice to be good therapy, so keep up the good work. Regarding your reading of the Bible, don’t worry about making sense out of the stories you find there. They are, after all, just stories that may have made sense thousands of years ago when the world was a different place altogether. Life, living, and understanding the universe in which we live was quite different back then. If you enjoy reading really strange biblical mythology, much of which is “borrowed” from the OT, try reading the Quran. It’s a much shorter book than the KJV, and many of the Suras seem to be, mostly, repetitions of the three main points: Allah is great (in every way imaginable) believers will be rewarded, and infidels are doomed to burn in hell. Think: the book of Revelations on steroids.